Slice bell peppers in half, seed them. Add eggs to a bowl, add a dash or two of milk, add garlic and spices and whisk until well mixed. 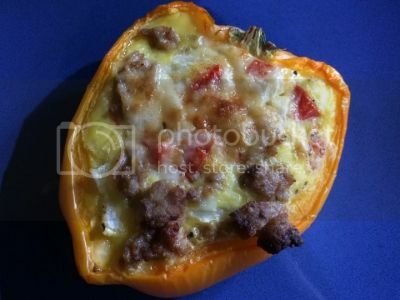 Arrange halved peppers in baking dish and layer with breakfast meat, veggies, cheese, then fill with egg mixture. Repeat until all the peppers are full. Put the baking dish in the oven, bake at 350 for 20-30 minutes, or until eggs are fully cooked. Top with your favorite condiments before serving and enjoy! It's 6:20 a.m. here and that looks like a mighty delicious breakfast.